AT NASHUA LOWVELD WE ARE ALL ABOUT SAVING YOU TIME, SAVING YOU MONEY AND PUTTING YOU FIRST. 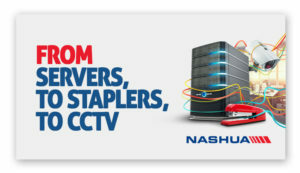 Nashua is the leading distributor of digital office automation equipment and document output solutions in South Africa. Nelspruit based Nashua Lowveld is a well-established and trusted leading distributor of digital office automation equipment and document output solutions in South Africa. Nashua Lowveld is also one of the top IT companies in Nelspruit. We have a wide range of industry leading office products including multifunctional printing devices, colour laser printers, wide format printers and high volume printing devices. The services and products offered by Nashua Lowveld are not limited to printers and IT services. Along with being a leading IT, printer and copier company in Nelspruit, Nashua Lowveld is also a supplier of CCTV and installations. Nashua is a Hewlett Packard gold partner. As a gold partner, Nashua Lowveld has undergone extensive technical certification during which HP has determined that Nashua Lowveld is able to provide a high level of service capability, to deliver support to any of your Hewlett Packard products and handle any breaks or other technical Hewlett Packard related issues. Nashua Lowveld is the preferred supplier of printers and copiers in Nelspruit, and other areas in the Lowveld, providing products and support to a wide range of satisfied businesses and private individuals.